A teen pool party will take on a different flare or theme, depending on if it is girls only, boys only or a mixed group. 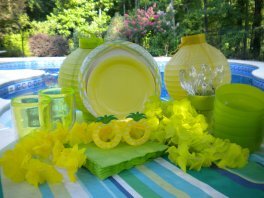 Set a them such as as a Flip Flop Party, a tropical Luau, or a beach party. Be sure to include some ice breaker games and swimming pool games that will get everyone into the pool. Host a Flip Flop Party that includes flip flop floats for the pool or provide pedicure supplies and nail polish for everyone to have their own pedicure. Decorating with flip flops is inexpensive and colorful. Just use lime green or bright orange flip flops from the Dollar Store. Hang them on the pool gate or use them in the table setting. There are many flip flop games and crafts that can be used as ice breakers or as craft time. 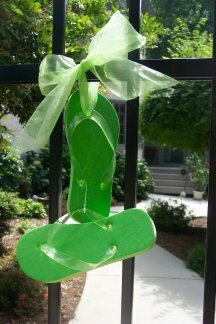 Provide supplies for each guest to decorate their own flip flop to take home. In the invite instruct everyone to find and wear an Hawaiian shirt to the the luau party. Let them know their will be prizes for the most colorful, most fun, or most Hawaiian themed shirt or blouse. Provide silk floral leis for each of the guests when they arrive. Play Hawaiian or Caribbean music. Include a fun limbo game. If the party is in the evening have bamboo tiki torches set out and lit around the pool. Hang battery operated paper lanterns from the umbrella ribs for extra evening ambience. 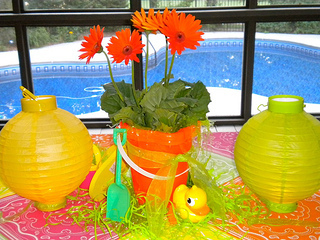 Use new sand buckets and colorful napkins for chips and snacks. Serve salads using a new shovel. As an ice breaker and to get everyone into the pool, purchase cheap 15" beach balls - enough for each of the guests. Write the name of your friend on the beach ball using a permanent marker. Toss all of the beach balls into the pool. Wait until everyone has arrived and have each person go and find their ball. Our teenage niece loves playing the game called Submergency. Set the timer to run out in 15 to 90 seconds. The team member who gets to the ball first to deactivate it wins. Diving games, pool volleyball games and pool basketball games are all favorites for this age group. Music is essential for any teen party. 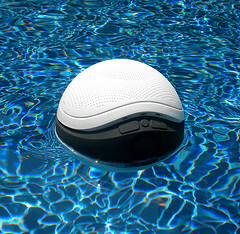 We love our waterproof floating speakers. Of course our favorite place to put it is in the swimming pool. It's expandable up to 10 additional speakers. Our grandkids always ask us to get it in the pool for some fun background music. The audio range is up to 150 feet. The speaker requires 6 AA batteries and the transmitter needs 4 AA batteries.